When you think of a rustic 1950s farmhouse in rural Pennsylvania, what comes to mind? To most, a farmhouse evokes thoughts of comfort, coziness, and charm. However to designer Tom Givone of Givonehome, it was curved walls. When Givone first arrived at the house, the original architectural details of the home were overshadowed by unfortunate decades-old renovations. "It was a lot like other similarly aged homes I'd seen that had been updated over the years," Givone says. "The '70s called and wants its linoleum back. But I knew that the good stuff, like original wide plank floors and hand hewn beams, was lurking beneath all those layers." 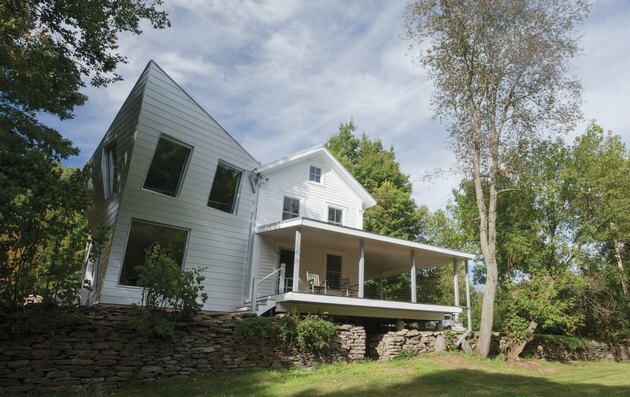 While the designer's first order of business was to bring the house back to its original condition,"The second was to turn it on its ear," says Givone. Without crafting a new design steeped in antiquarianism (a common direction in many preservation projects), Givone chose to give the architecture a thoroughly modern and surrealist twist. Literally. The new feature: five curving columns that form the skeleton of the home's new addition. With the help of JRA Architects in Scranton, Pennsylvania (Givone splits his time between New York City and the Catskill Mountains), they fabricated the columns for the framework by sourcing materials from a Chicago steel company that usually specializes in building tracks for roller coasters. Within 18 months, the project was complete, curves and all. 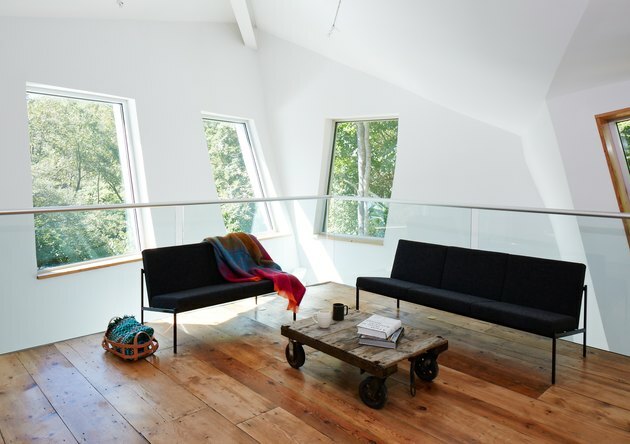 The balcony, suspended by stainless steel cables, was built to draw the eye up the slight curves on the wall. The aluminum porch columns were anodized to avoid corrosion. 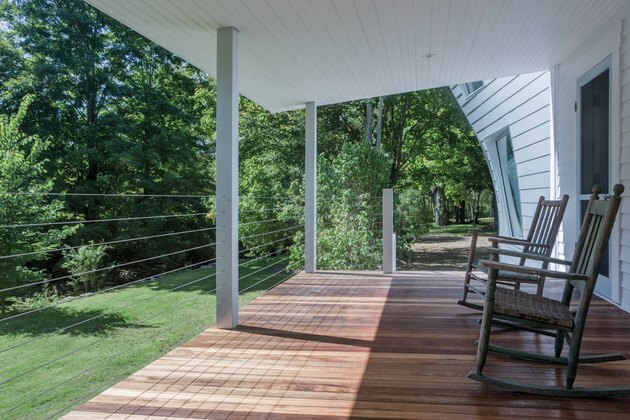 Thin stainless steel cables allow for maximum views of the creek that cuts through the property. The only stipulation the clients had for the new design was that it needed to bring in more natural light. Givone heeded their request by building large windows within the twisting walls. "Twisting it in this way opened up new sight lines as well," adds Givone. Now they have the ability to view the client's nearby childhood home and the surrounding fields. The dining room opens into the kitchen where large curved walls hold glass panels that display the pastoral setting of the creek and fields outside. The 12-foot window in the dining room produces natural light perfect for cooking or dining. The designer Givone, who is self-taught, specializes in reinventing 19th century structures by blending contrasting industrial and primitive materials. 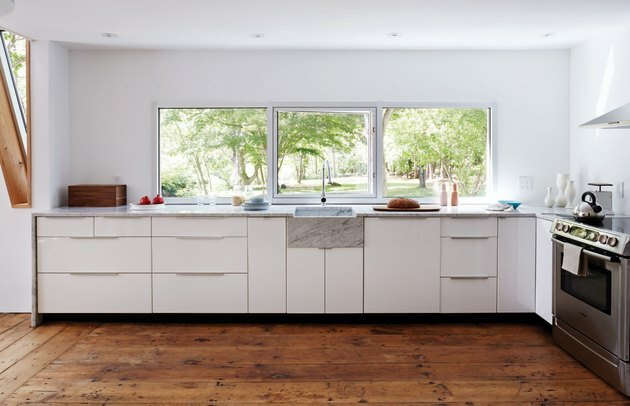 In the kitchen, Carrara marble, used for both the countertop and sink, is mixed with sleek, modern appliances. The client grew up, along with her seven siblings, in an old farmhouse just across the street where one of them still lives. The home's unique architectural design serves as an artistic depiction of the gravitational pull between the two homes. "I imagined this family bond as a physical force, like a gravitational field between the two homes, acting on the addition and 'pulling' it toward the original farmhouse across the street," Givone shares. 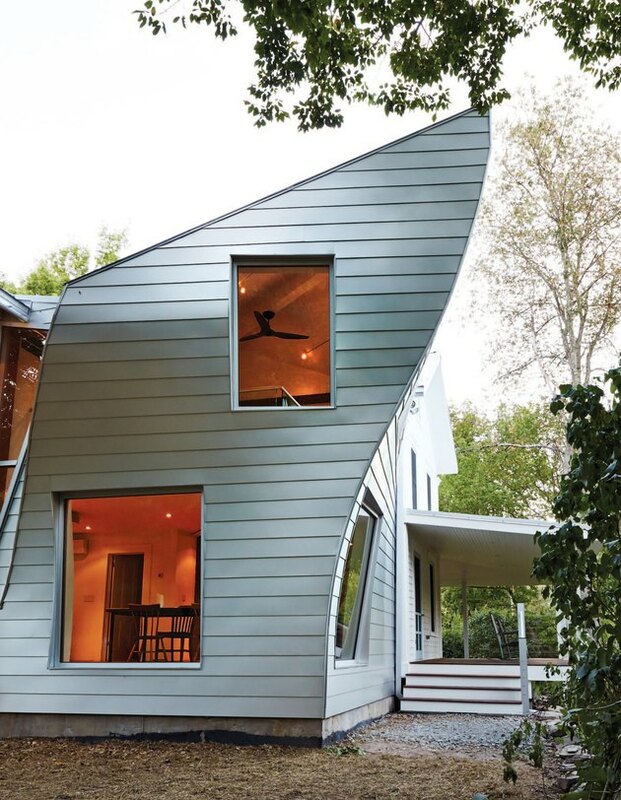 The addition's unusual shape was fabricated by a metalworks company in Chicago. The curves are visible from both the interior and exterior. 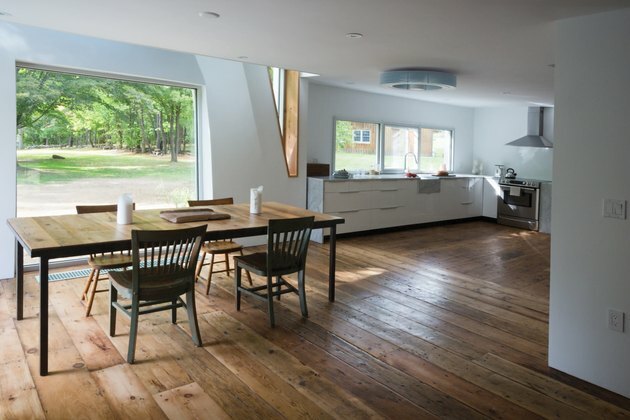 For the living room, Givone played on classic attributes of a farmhouse by installing a Haiku ceiling fan. In the master bedroom, the original ceiling beams were combined with salvaged hand hewn ceiling beams. A mix of both vintage and contemporary furniture, all in a similar minimalist or restrained style, reflect Givone's approach for the rest of the house. The home's unfortunate past renovations included linoleum floors, which according to Givone had to go. Layers of linoleum and plywood were removed to reveal the original wide-plank floors. The wood grain is a perfect contrast with modern touches, like the window privacy glass surrounding the shower stall, complete with a 16-inch stainless steel showerhead. A mix of contemporary and historic design can be found in the bathroom. A schoolhouse sink from the 1920s was installed with modern Jado faucets (the tap openings had to be enlarged in order for it to work). 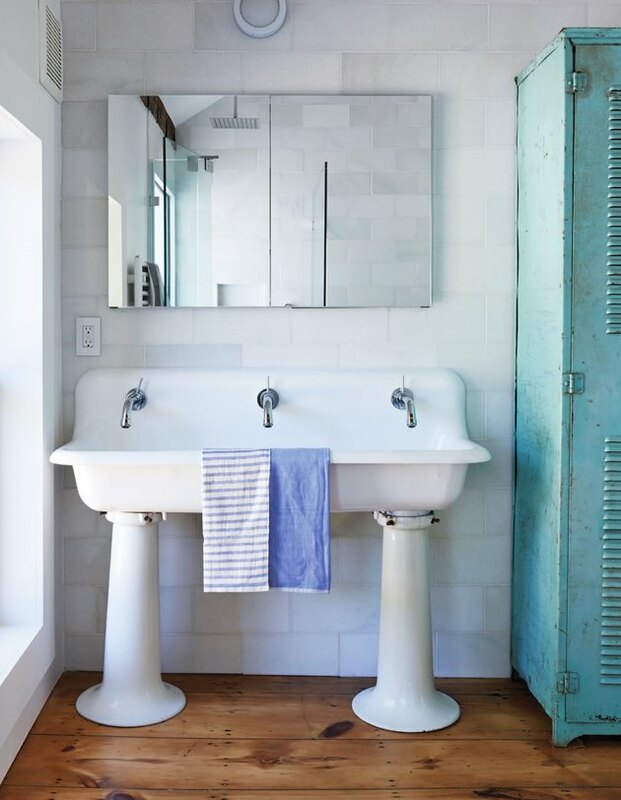 The sink, along with a vintage turquoise locker, is surrounded by the house's original plank floors and newly-installed quartz tile.